Mr Jamieson Jailed & Bailed! Kingsbury High School Deputy Head, Mr N Jamieson was today arrested during school assembly by PC Guinnelly on suspicion of illegally confiscating hats and hoodies from lower school students. Mr Jamieson was later charged at Wealdstone Police Station. His grounds for arrest were read to him by PC Bishop. His detention was authorised by Custody Sergeant, Sgt Mills and he was thoroughly searched before being taken to a cell. Bail was set at £1,000 which was to be donated to St Luke’s Hospice, Harrow. Through the generosity of staff, students, parents/carers and the local community, over £1,300 has been raised and the amount continues to rise. 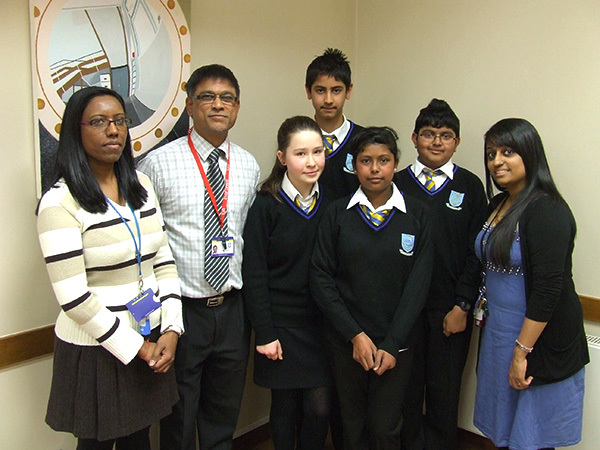 On Monday 11 February, a group of our Year 8 & 9 students competed in the first round of the Brent Maths Challenge. On Thursday 27 February, the same group progressed to the second round against JFS, Claremont High Academy and Preston Manor. Two of our teams came second in their categories and overall Kingsbury High were only narrowly beaten by JFS. Two Year 8 and two Year 9 students were chosen to go on to the regional final. On Saturday 9th March, fourteen Year 9 students competed in a Mock Trial Competition against nine other North London schools at Willesden Magistrates Court. The fourteen novice ‘legal eagles’ studied the case of Morgan Crookshank, a man accused of a serious assault, over many lunch time and after school sessions. After two closely fought rounds, they came away with a fantastic result for the new kids on the block, taking home awards for best magistrates and best prosecution witness. Through competing in the competition, organized by the Citizenship Foundation, the students, chosen because of their ability to produce a cohesive argument and commitment to the life of the school, gained a greater understanding of how the law and politics directly affect them. 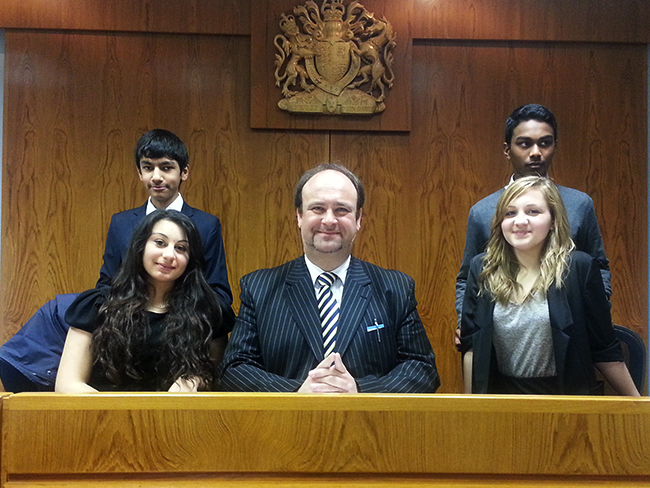 The students were a real credit to the School and themselves and we hope to take part in another mock trial soon. On the afternoon of Monday 11th March the students of Kingsbury High school treated the Village School children and some local pensioners to the Perpetual Motion acts of 2013. Vibrant costumes, loud music, hip hop to contemporary dances and interactive duologues filled the hall and audiences were entertained throughout for a two hour period. Students ranging from Year 7 to 12 came together to show off Kingsbury High School’s talent and this was a successful turn out. In total there were 25 performances and each act performed to show a variety of unique and individual pieces. A current of energy flowed around the hall as each act, with their enthusiastic and charismatic routines, managed to excite and captivate audiences when showcasing their hard work. Some of the performances included Locksquad, a Peter and the Wolf interpretation and a teenage life duologue. The dress rehearsal was the first time that performers got a chance to show their abilities and put on a good show and it was a jolly good show. Members of Kingsbury High School’s Art Department, Mr Taylor, Ms Ferguson and Mr Knight, accompanied 12 Sixth Form students on an art trip to Florence and Siena. The main aim of the trip was to broaden students’ knowledge of Italian lifestyle, culture and art with a particular emphasis on the Renaissance period. The students engaged in a range of practical work, sketching outdoors and in galleries and photographing areas of interest. The Italian tour included gallery and museum visits to see works by Michelangelo and Leonardo da Vinci, Giotto and Donatello, along with other medieval and renaissance works. Students and staff climbed several tall towers and explored cathedrals, monasteries and churches. Every year since 2010, Kingsbury High School Library has created a set of posters to celebrate World Book Day and encourage students to try new books. The posters depict teachers and non-teaching staff alike dressed up as book characters and literary icons. Produced to a very high standard by the school’s Creative team, the posters have been a huge success with students and the local community, and the unveiling of each new set has become a highlight of the school calendar, accompanied by a sharp rise in book borrowing.